DID YOU KNOW? 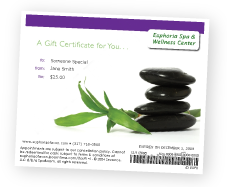 Euphoria regularly offers several introductory specials and now also accepts SpaFinder and SpaWeek gift cards and certificates! Please be sure to let us know if you have a gift card or gift certificate at the time you call to schedule your appointment. SpaFinder, SpaWeek & SpaWish gift cards may be redeemed on full fee services only. WANT MORE? Check out our seasonal specials, too! All gift cards and certificates must be presented upon arrival. Corrective facials, peels & resurfacing treatments may be purchased in buy-4-get-1-free packages. Same-priced treatments may be mixed within the same package. All services must be used by the same individual (no package splitting). Other restrictions may apply & a consultation may be necessary to determine the appropriateness of some treatments for certain individuals. Simply “click & print” or show any of the coupons below directly from your smartphone to present your special offer at the time of your visit! Get Instant Gift Certicates NOW! Click HERE to design & order your certificate now! Provide your e-mail address below to receive special news and promotions from Euphoria of Avon. Get Instant Gift Certificates NOW! Spa & Wellness Center | ©2013 Euphoria | Developed by NuMedia Marketing, Inc.